But the Children’s Gallery had a big surprise. In 1951, a reconstruction of a coal mine was opened. It was off to the left along a short passageway as you came down the stairs. There were quite a number of tunnels and side tunnels, with cutting machines, battery engines and trucks on rails, and dummies for the miners themselves. The walls looked like real coal, and there were real timber pit props and steel arch supports. To me, in the late 1950s, it was fascinating and very realistic. I loved exploring the coal mine. I read somewhere that the coal mine was always the highlight of one family’s visits to the Science Museum. There’s very little information online about the coal mine, and very few photographs, and I don’t know when it was closed. Fortunately, there is a short and jolly British Pathé Newsreel here from 1951 about the construction of the Science Museum’s coal mine. I wonder what youngsters would think of such an exhibit now? 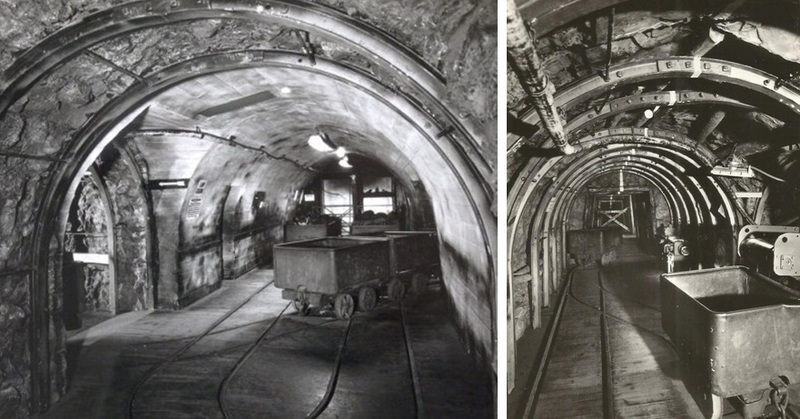 On the left is of one of the tunnels with coal tubs on rails, a side-tunnel, and a lift up to the pit head at the end. On the right (the photo is taken from an old Science Museum postcard, no 40) is a ‘haulage road’ with a truck next to a conveyor belt. The tunnel is closed off at the end by wood struts marked ‘No Road’. I can vaguely remember this. As I have said, photographs of the Children’s Gallery are very thin on the ground. 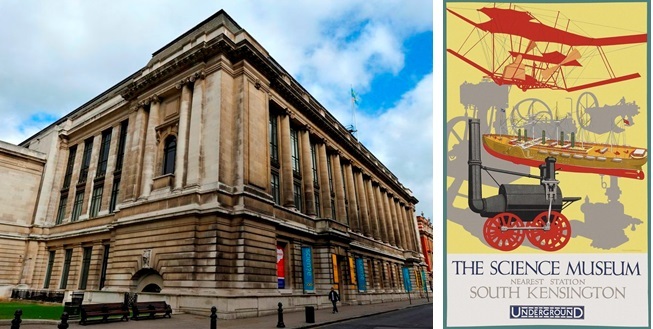 The Museum did produce a couple of printed guides to the gallery, one just after it first opened in 1935, and another one in 1973, both of which were re-printed at various times. 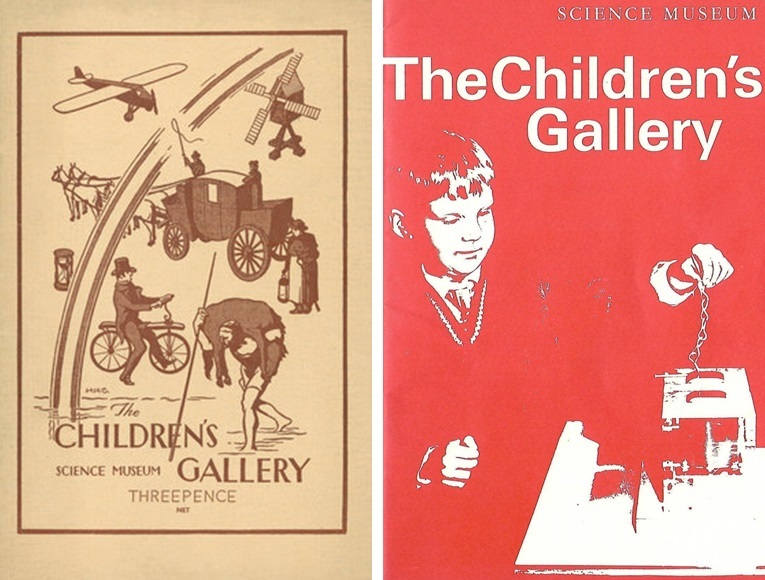 The first image on the right is the cover of the first guide, published in 1935, priced threepence or 3d (just under 1p). I have a copy of the re-printed guide from 1946, which was fourpence. This was the year after the end of the Second World War. The second image is the 1973 guide which cost 3p. 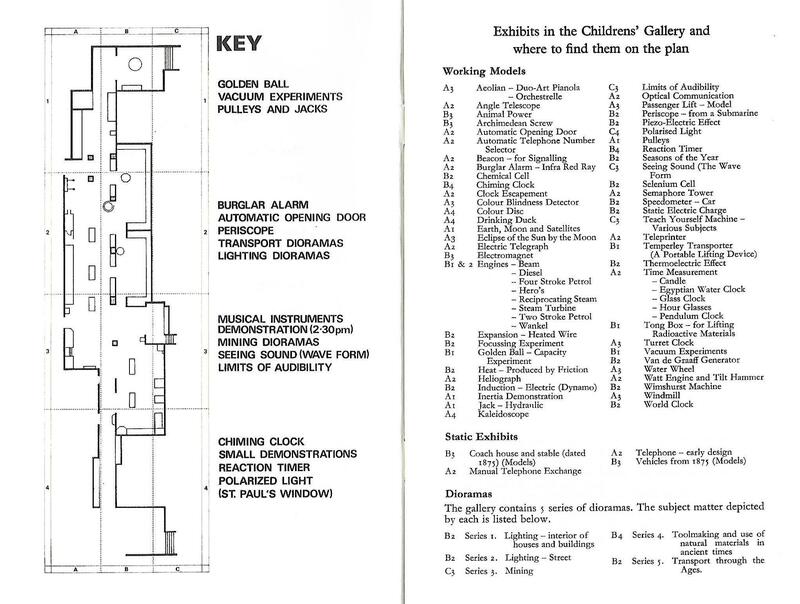 This is a plan of the children’s gallery and a list of the exhibits, which was included in the 1973 guide. 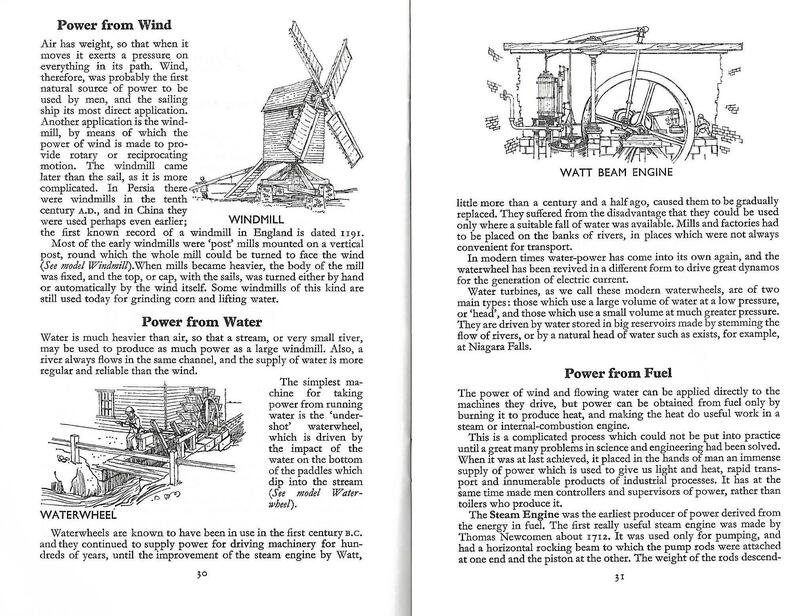 These are a couple of pages from the 1973 guide. Though the cover of the guide was now red compared with the light brown cover of the earlier guide, the text inside hadn’t changed much, though it is informative. Most of the hand-drawn illustrations were the same as in the earlier guide, plus a few more up to date ones: an ocean liner, a hovercraft, and a diesel express train. But there wasn’t any colour printing, the layout hadn’t changed, and there were no photographs. Upstairs, there were the beam engines in the central hall, and three or four floors of exhibits above that. At the back of the museum was another huge hall devoted to transport, with many actual full-size cars, boats, steam engines etc, plus many working models, and above this, the uppermost floor was for aircraft. There was so much to see, but I can still remember three exhibits. 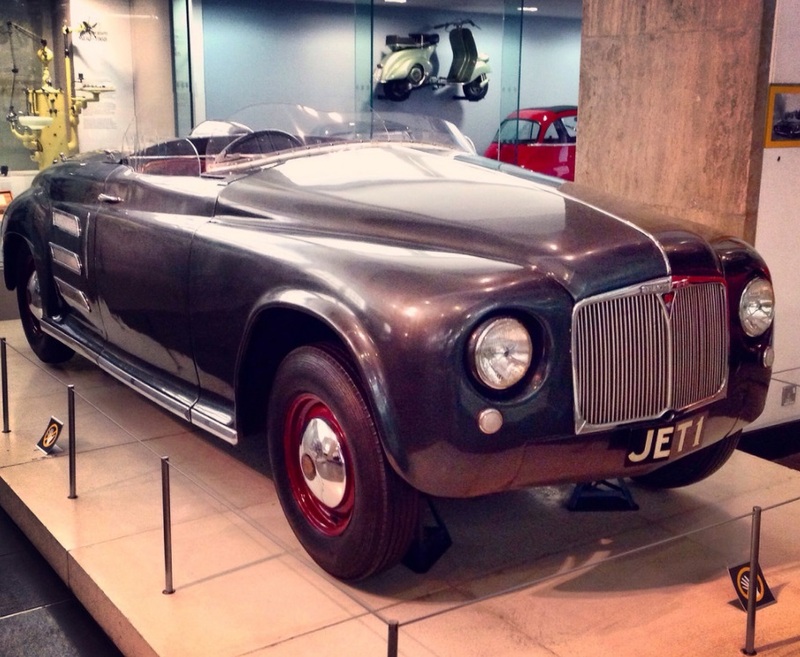 In between the two main halls was Jet 1, a gas-turbine car built in 1950 by Rover, the first such powered car in the world, and which is still on display, In the transport hall was the gigantic prototype of the Deltic diesel locomotive. And then there was the demonstration that ended with a ‘big bang’. 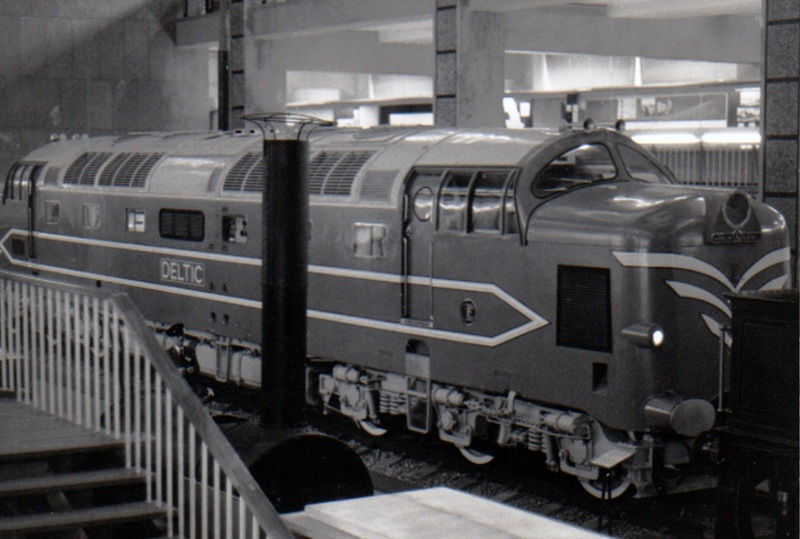 This enormous prototype diesel locomotive, DP1, and commonly known as Deltic, was built by English Electric in 1955. For its time, it had a very high power output of 3,300 hp, the highest in the world for a diesel locomotive, and an acceptably low axle load. 22 similar locomotives were ordered by British Railways for use on East Coast Main Line express passenger services. The prototype was painted a pale powder blue with cream stripes. In 1993, the Deltic locomotive was transferred to the National Railway Museum, and it is currently on display at their Shildon site in County Durham. Getting it in and out of the museum must have been quite a feat. The big bang demonstration, which was held each day, was a very loud bang created by an electricity discharge. The colossal electrical equipment, which I now know included an impulse generator, was located somewhere on the ground floor, I think in a corner on the right as you went towards the transport hall. On the left is a photo of the discharge as it happened © Science Museum/SSPL. I couldn’t find a photo of the demonstration area itself, but it was a bit like the photo in the centre (which is from Germany), without the people of course. 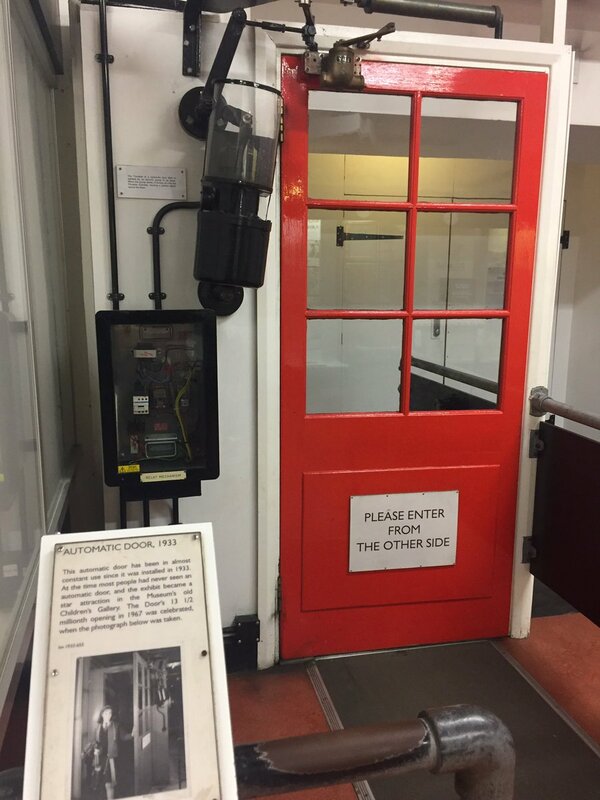 The original notice, on the right, which is from 1975, certainly explains why I stood nervously behind the glass screen waiting for the bang. 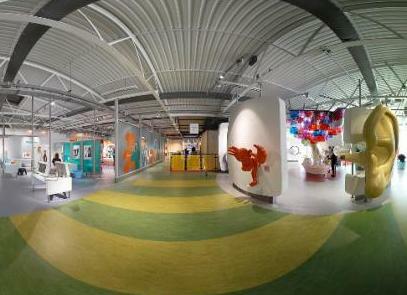 In Britain, the first dedicated children’s museum, as opposed to galleries for children in existing museums, is Eureka! The National Children’s Museum in Halifax, West Yorkshire, which opened in 1992. The Association of Children’s Museums (ACM) counted 341 member institutions in 23 countries in 2007. The United States has played a leading role in the establishment of dedicated museums for children with interactive exhibits focused on learning through play. Indeed the first children’s museum in the world was the Brooklyn Children’s Museum in New York, founded in 1899, with the next oldest four also having been opened in the USA. The fourth oldest is the Children’s Museum of Indianapolis – it opened in 1925 – and according to the ACM it is the largest children’s museum in the world. After the Science Museum, you could go to the Geological Museum next door in Exhibition Road or to the Museum of Natural History in Cromwell Road, that is if you had the energy or the time. But more often than not, I went for lunch or tea at the nearby Joe Lyons tea shop in South Kensington. I can’t remember exactly where the tea shop was, but I know that after getting your cafeteria (self-service) meal you went downstairs into the basement to eat. 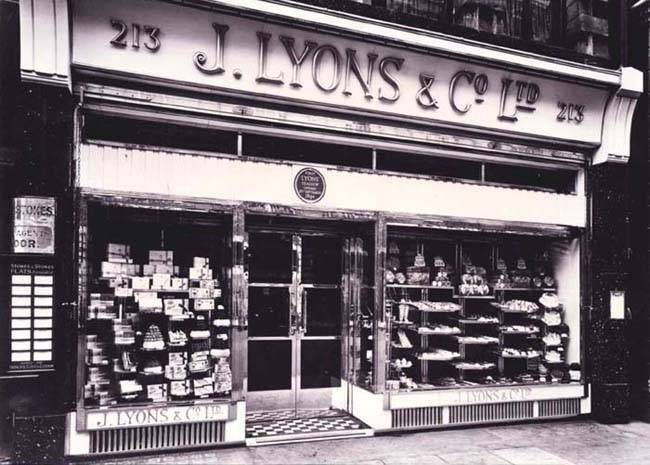 A large cup of tea at a J Lyons teashop cost 2½d (1p) in the 1950s. The tea shops shouldn’t be confused with the more upmarket and more expensive Lyon’s Corner Houses. In 1954, J Lyons was the largest catering company in the world. There were 230 J Lyons tea shops in Britain, and at one time, seven tea shops operated in London’s Oxford Street alone. Between 1970 and 1972 the tea rooms were converted into Jolyon Restaurants. However increased competition and overstretched borrowings led to the last tea shop closing in 1976, and in 1978 Lyons was taken over by Allied Breweries. 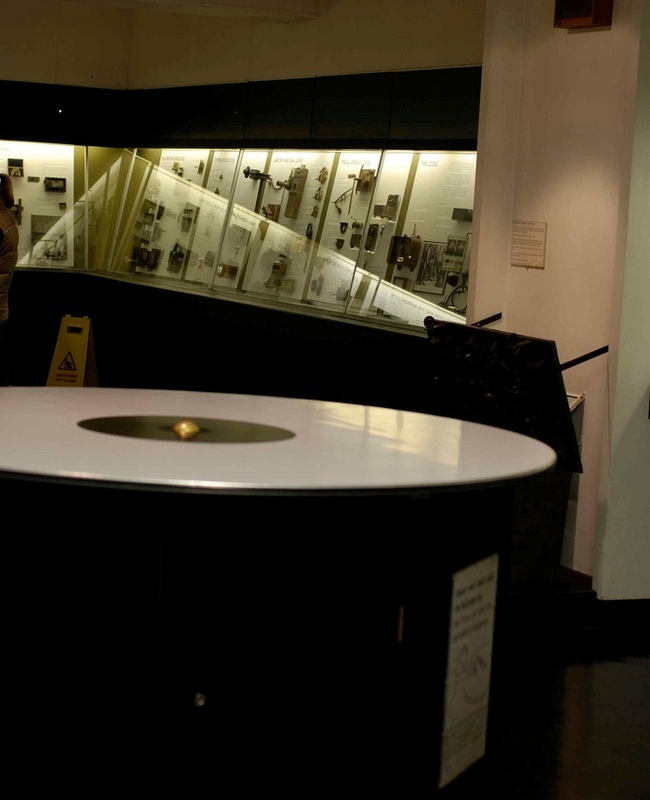 I worked at the science museum in the 70’s and at one point I was responsible for maintaining the working exhibits in the children’s gallery, it was a full time job as little darlings worked everything into the ground in no time at all. I’m sure the volcano with sound effects is still there, in the Geological Museum that is, as is the earthquake simulation. That has a mock-up of a shop in Japan and all the containers on the shaking shelves fall over, but they’re pulled back into place by string at the end of the demonstration! Still very popular I think. Going back to the 50s and 60s, the museum relied for excitement, as I saw it anyway, on a big rotating globe of the world as you came into the main hall, a large marble fountain, the amazing gemstone collection, a vase made of Blue John fluorspar, and wonderful dioramas (three-dimensional models in glass fronted showcases) on each side of the main hall, such as one of the Carboniferous Coal Forest! This was well before the acclaimed Story of the Earth revamp with its huge reproduction rock face built at the back of the main hall in 1971 – and its mine-like entrance into the active model of a volcano – and the escalator that was installed in 1986 that took you up from ‘Earth Hall’ into the ‘earth’s core’. 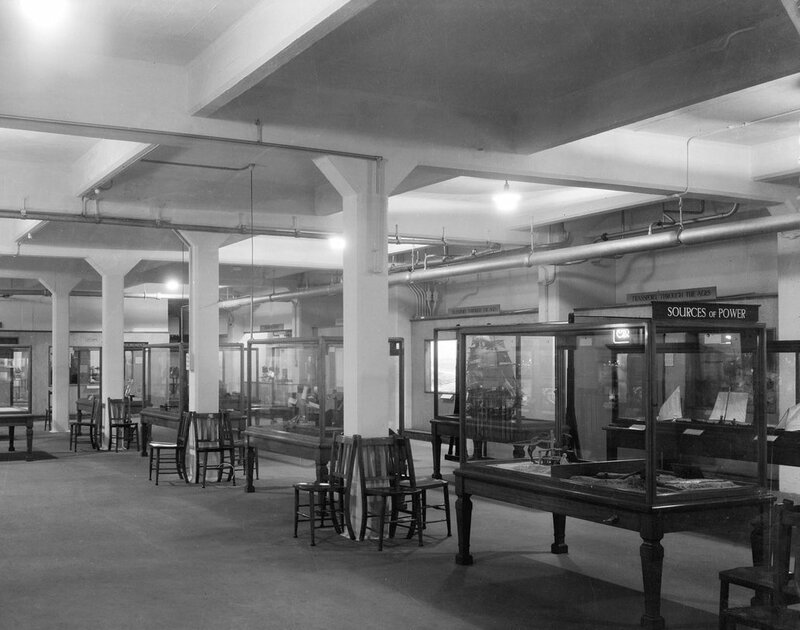 Back then, on the upper floors or galleries were hundreds of horizontal display cases of rock and fossil specimens. Each floor was divided into periods of geological time such as Silurian or Ordovician. I liked those names. I sometimes visited the geological library at the back of the main hall and felt very grown-up, but you weren’t allowed to take your sandwiches in there.